Mixtress Chronicles /// Egg Protein Conditioning Treatment, Great for Fine Natural Hair! If you follow me on Instagram, then you saw recently that I did an egg protein conditioning treatment. I don't consume eggs regularly anymore but had two left over from making omelets a little while ago. I didn't know what to do with them so I thought it was the perfect time to try out the egg protein conditioning treatment. It's super easy and inexpensive to make and any hair type or texture can reap the benefits: light protein, imparts shine or sheen (for me it would be sheen) and smoother strands. As a fine hair (and medium density) natural, my fine strands adore protein treatments regularly and it took a liking to this light protein one. I could do this every other week. The treatment had my hair feeling fortified and smooth and helped impart more definition to my coils. Mix all three ingredients together well in a glass or plastic bowl. 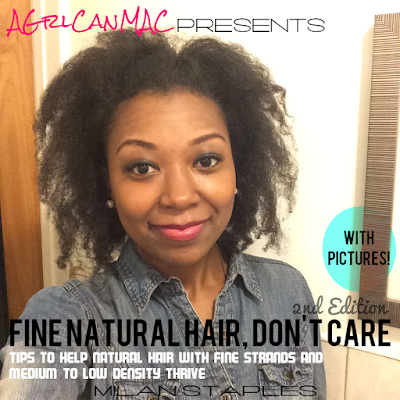 Apply to hair in sections with hands or an application brush and leave on for at least 15 minutes before rinsing out. Then continue with your usual wash routine. You can apply this mix before or after washing your hair. I normally apply my conditioners to my hair before washing it. You also can leave this on for however long you like; at least15 minutes should allow for the treatment to be effective. I got caught up in cooking dinner and housework so I left mine on for about an hour but that's not necessary to reap the benefits. You can put a plastic conditioning cap on while the conditioner is left on or not. I imagine adding heat or steam would be a nice treat with this treatment too. One last thing: When rinsing the treatment out, make sure that the water isn't too hot or the egg mixture will cook! Yes, you will have scrambled eggs in your hair if you're not careful! I found a scant few, lil fried egg pieces in the front of my hair. Must have been when the apartment above me, flushed their toilet and the water temperature got hotter for a second. Lol. Going to try this tonight. In dire need of a good DC! Hi Denise. Hope it gave you good results! I love this easy DC.